The nursery “Túrbula Little Kids (Petits)” was founded the school year 2012-13 in response to the continued demand of the families of the School and the need to enroll their 0 to 3 year olds at Nursery School. The new project is endorsed by more than 50 years of experience. We have NEW AND MODERN FACILITIES that provide students with a cozy and familiar atmosphere. 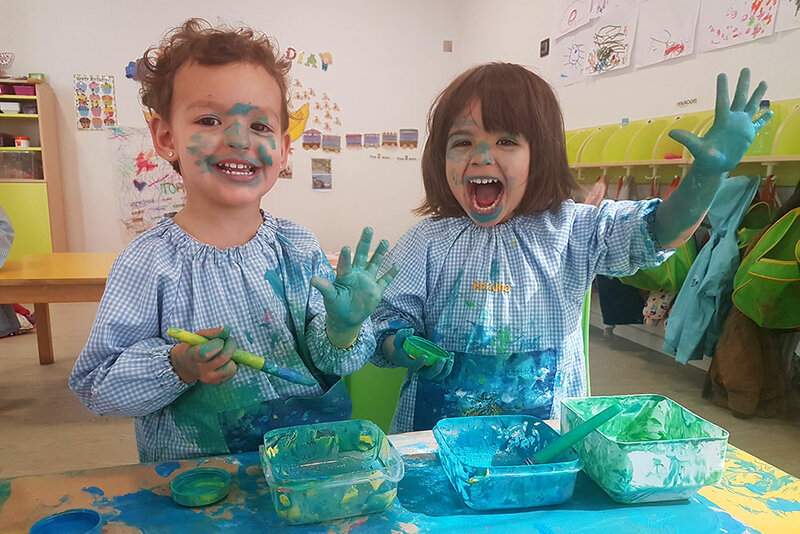 We base our work on the individualized attention of children and their families, promoting activities that encourage their involvement and participation and ensure close collaboration between the Nursery and the family. MOTOR DEVELOPMENT through activities in which children can freely explore the space according to their interests, thus gaining control of their movements. COGNITIVE DEVELOPMENT – through actions that stimulate the capacity for observation and abstraction through exploration, discovery, symbolic play, and so on; activities that encourage communication both with the adult and with their fellow kids. SOCIO-AFFECTIVE DEVELOPMENT – from the daily actions we make sure that kids are in a safe and affective environment in order to allow them to begin to define their own identity and establish their first social relationships. DEVELOPMENT OF PERSONAL AUTONOMY – through actions that establish daily routines that will allow babies and toddlers to achieve greater autonomy in certain habits such as hygiene, nutrition, sphincter control, etc. Our METHODOLOGY is characterized by being motivational, active and individualized taking into account the interests and individualities of each child. It is based on experimentation, manipulation, observation and discovery, where boys and girls are the protagonists of their own learning. Our professionally and personally qualified EARLY CHILDHOOD EDUCATORS are characterized by a special sensitivity, showing at all times affection to children in order to ensure that our pupils feel secure, loved and, ultimately, become HAPPY CHILDREN.